It seems to be working a breakdown train and the date could really be any time in BR days. The interesting thing is the location. The buildings in the background are distinctive and should be identifiable. So where are they? I don�t believe this is Wolverton. Northbound, there are no houses beyond the carriage sheds (and the line is on an embankment). Southbound, the works and housing development would be on the other side of the line. If the number of the Super D is readable on the original, perhaps we can make some deductions from where it was shedded? The Cowans Sheldon crane appears to be that which was based at Bescot from 1935 until 1956. ( RS 1024/15 CS 2933 / 1906 ). This is on a double track main line. I struggle to see how that could be related to Wolverton! Ted, can you tell us the engine number please, so that David or I can check the allocation history? If it‘s allocated to Bescot or any other W Mids shed at any point, that would be a very useful pointer. However, it doesn’t look like anywhere in the W Mids that I am familiar with. Christopher, do you have any info on where the crane was after 1956? 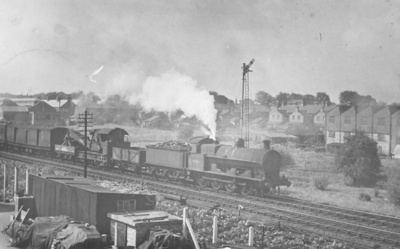 Note that it’s carrying Class A headlamps (Class 1 if after 1961) so it’s a breakdown train on its way to clear the line.